A bronze bust of Gwynfor Evans, the late president of Plaid Cymru and Welsh language campaigner, has been unveiled in his home town of Barry. Plaid's first MP was born in the Vale of Glamorgan seaside resort in 1912. Former deputy head teacher Gwenno Huws started fund-raising for the bust after she retired last July. She said: "It pained me to see that there was nothing to remember one of the town's most well-known sons and one of Wales' leading statesmen." Mr Evans, who died aged 92 in 2005, was the son of Dan Evans, who founded a department store in the town. His victory at the 1966 Carmarthen by-election was Plaid's first parliamentary breakthrough. 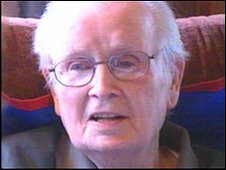 Fourteen years later he threatened to starve himself to death in the cause of Welsh-language television, leading to the foundation of S4C. Although he spent most of his life in Llangadog, Carmarthenshire, he was educated in Gladstone Road Primary School and then in Barry Boys School, or Barry County School as it was then. Mrs Huws, former deputy head at Ysgol Gymraeg Sant Baruc, Barry, formed a small committee which commissioned the work. She said: "When I retired in July last year I saw my chance to do something about it so I set about establishing a fund to raise money for a fitting memorial to him." 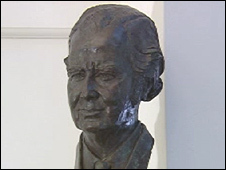 The bust, sited at Barry Library, was unveiled by Dafydd Elis-Thomas, presiding officer of the Welsh assembly. It was designed by the Llanuwchllyn-based sculptor John Meirion Morris and carries a bilingual inscription which in English reads: "His inspiration, like our banner unfurled, is a gift from Barry to Wales and the world".